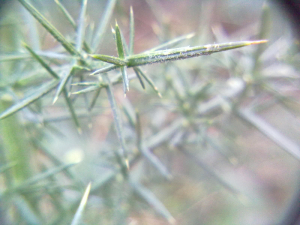 Observation - Gorse through a hand-lens - UK and Ireland. Description: Sharp spiny evergreen growth, scented yellow flowers, even in the depths of winter. Sharp spiny evergreen growth, scented yellow flowers, even in the depths of winter.